Sewing a straight line is one of the most basic sewing tasks that most sewers will find themselves working on all the time. It’s an absolute must to master this task before moving on to other more advanced sewing tasks, as it’s going to be an integral part of your sewing foundation. That said, sewing a straight line is also not as easy as it sounds (but definitely easier than a slip stitch!) We are not trying to scare you, but you need to have an idea of what it takes to learn this task, or you will often find yourselves giving in to the frustration. 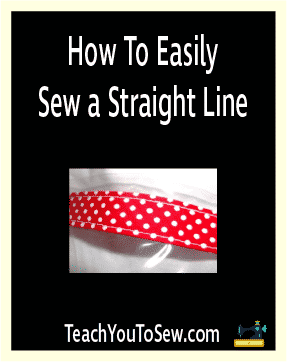 So without further ado, let’s jump in with some determination to learn how to go about sewing a straight line. Get a scrappy piece of fabric, preferably a plain cotton one that’s not stretchy and doesn’t have any kind of designs on it. Fold the cloth so that you would have two layers to sew on. The next step will be to thread your sewing machine and decide on a stitching length. The average length is likely going to be your best bet, but feel free to play around with different shorter and longer lengths to find out what you’re most comfortable with. Then put the fabric under the pressure foot, and make sure it’s right edge is perfectly in line with the right edge of the pressure foot. Once it’s aligned perfectly, lower the foot to hold it in place. Then use the up and down buttons to move the needle all the way down and right into the fabric. At this point, you can slowly press the foot pedal to start sewing, but don’t sew more than an inch. Use the back-stitch button to sew back over the inch-long stitch that you just made. Then sew forward an inch again, which would result in making a knot that would prevent stitches from going loose. You can now continue sewing forward, with your focus being on making the piece of fabric be perfectly in line with the pressure foot. Sew at a steady pace in order to prevent uneven stitches due to lack of speed, but be careful to not let the speed get out of control, which is something you’re recommended to follow until you’re out of your “beginner” stage of sewing. If you’re finding it difficult to keep the fabric properly aligned with the pressure foot, you can also put a tape on it to make things easier. Finally, when you have reached the end of the fabric, you can make another knot. Finally, use a scissor to snip (cut off) the threads from the fabric, and voila! You have just sewed your first straight line! But what if you want to sew a rectangle that will require sewing another straight line without breaking the connection with the one that you just sewed? Well, just sew all the way to the end, keeping a distance of just a quarter or half inch between the stitch and the end of the fabric. Then make sure your needle is well into the fabric just like you did before starting to sew the first straight line. Lift the pressure foot, and simply turn the fabric in a way that now the part of the fabric that you want to sew another straight line on is in line with the edge of the pressure foot. You will still be able to connect both the straight lines as the needle will hold the fabric in place while you turn it. You can then begin to sew again and sew another straight line, and repeat this process with the other two parts of the fabric until you get a rectangular, square or whatever you want. Head back to CHAPTER 4: Sewing 101 for Aspiring Home Sewists!